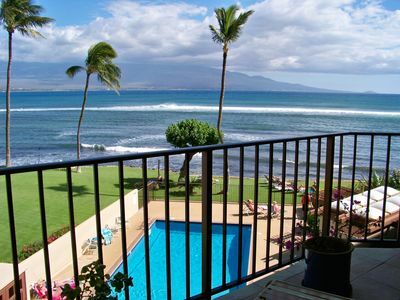 DIRECT OCEANFRONT 3-bedroom END UNIT condo on the shoreline of Maui's beautiful west coast. 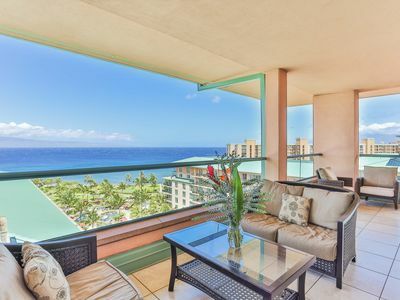 Unbeatable PANORAMIC OCEAN, ISLAND & SUNSET VIEWS from your highly-upgraded tropically-furnished condo, located literally steps from the shoreline. 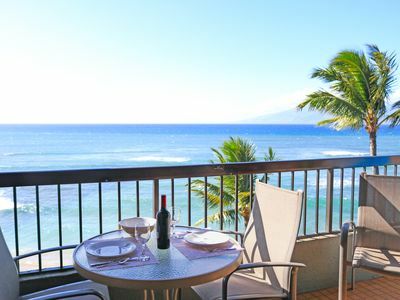 We call our privately-owned condo SunsetShoresMaui because of its location and great sunsets. 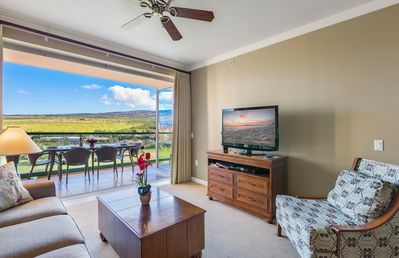 SunsetShoresMaui is our pride and joy. It is our home on Maui and we maintain it to high standards. We are OWNERS and truly care about our guests because you are OUR guests--not the guests of a rental agent or booking site with limited knowledge of our condo. 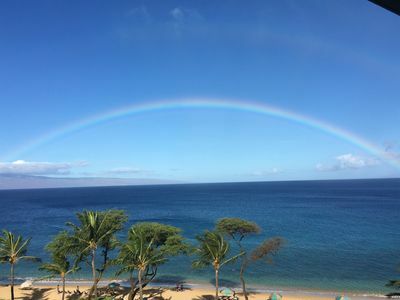 Memories of your Maui vacation will last a lifetime. Walls of glass in the living room and dining room provide amazing views of the ocean and shoreline. 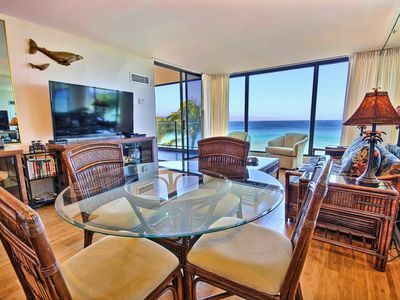 The ocean becomes part of the condo! We are not exaggerating when we say that the location and view are incomparable, and our many returning guests will agree. The sunsets are incredible! During the winter, you can even watch the whales from inside your condo. And year-round, the resident turtles swim along the shoreline and are such fun to watch. Great snorkeling and surfing from the shore right in front of the condo. The condo is on the second floor of a 2-acre tropical low-rise resort and is ideally-located for privacy and relaxation. 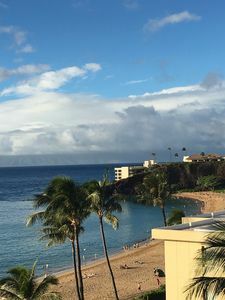 The resort has an oceanfront heated pool, gas barbeques and views of Molokai and Lana'i. 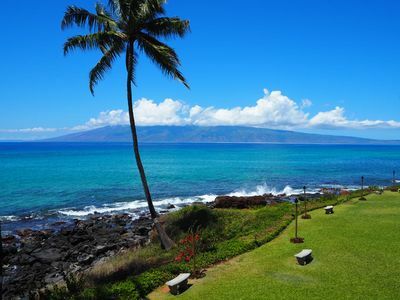 If you are coming to Maui to relax and enjoy the beauty of the island and the sea, then this is where you want to be. 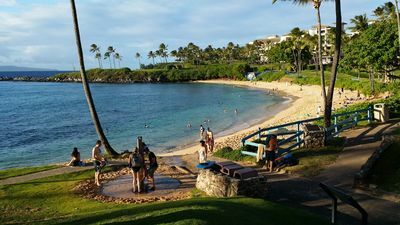 The uncrowded tropical grounds are a wonderful spot to relax, enjoy the fragrant Maui breezes, gaze at the ocean, watch the surfers ride the waves, sip a tropical drink, and watch the sea turtles as they swim by. Visit with other guests and make new friends--everyone is relaxed and friendly. 3 Bedrooms, 3 Baths. Comfortably sleeps 6. * Master: Main level. 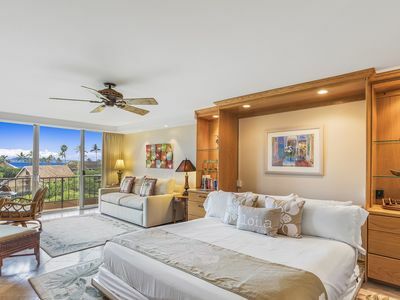 Comfortable new Sterns & Foster king-size bed, tropical bamboo flooring, and its own bathroom with a vanity topped with granite and an open walk-in glass shower. * Queen bedroom, Main Level: Pillow-top queen-size bed, tropical bamboo flooring, and its own flat panel "smart" TV. * Master: Upstairs, private loft. Newly-furnished with a comfortable Sealy Hybrid king-sized mattress and large bathroom with shower and vanity area. * Linens and towels, including beach towels, are provided. 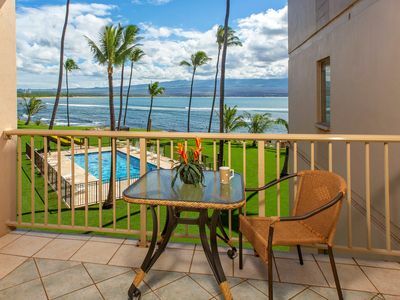 * Our condo and its lanai are NON-SMOKING (no smoking, vaping or e-cigs) as are all of the common areas of the property. * Living and Dining Rooms are newly furnished for your comfort with ample seating, a cathedral ceiling, new 55" Samsung smart TV, DVD, stereo system with iPod-CD, and that wonderful VIEW! * We think that the view from our dining room tops most of the restaurants on the island. 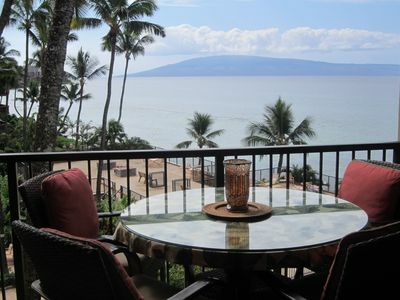 And you have your choice of dining inside, or outside at the table on your lanai...either is a great choice! * The remodeled open kitchen has custom cabinets, granite countertops, new stainless appliances, a kitchen island and is fully-equipped with everything you need for a great meal. Service for 12. * Walk to the local farmer's market up the street for tropical produce and baked goods. 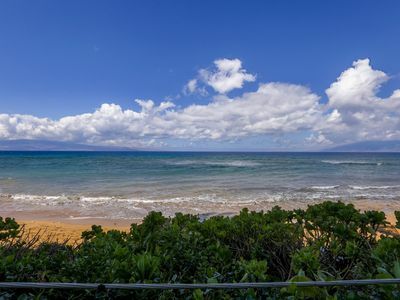 * Location is 5.5 miles north of Lahaina...midway between Kaanapali and Kapalua. We are conveniently close to shopping, restaurants, and golf courses. 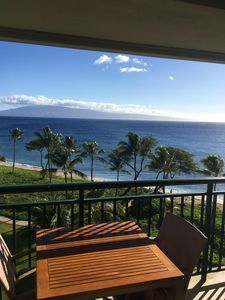 But, most importantly, we are far enough away from the noise and congestion of the busy resort areas so that you can enjoy the natural beauty of Maui, which we assume is what you came for. As the owners of this condo, we obviously think that it's a wonderful place to stay. After you have stayed here, we are sure that you will also agree. We have taken care to furnish it to be comfortable and have everything you need for your vacation. The furnishings are well-maintained and clean. And the view.... well, you will be amazed by the view! 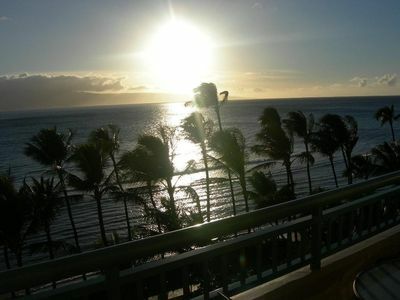 We hope you will choose to spend your vacation with us....Aloha! 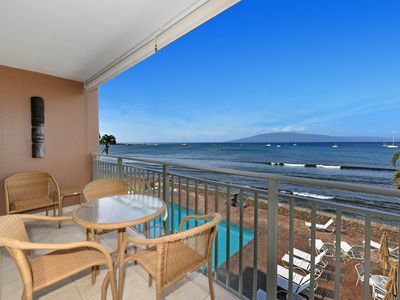 Up to 25% Off This Amazing Oceanfront 1 Bedroom Condo Near Maui Aquarium!!! LR 309 - 50 Feet From The Ocean! 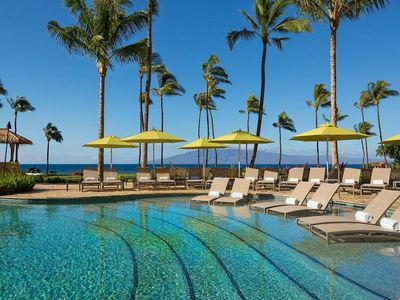 - Escape to Maui! - Direct Ocean Front! Mahana 607-Premium-Stunning First Class Luxury. JUNE FLASH SALE 💵 SAVE!! 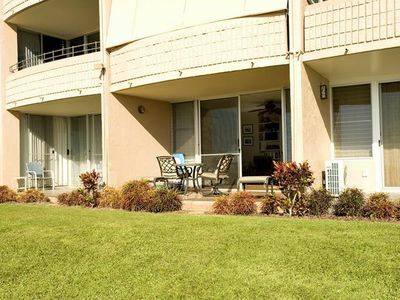 K B M Hawaii: Ocean Views, Steps to Water 1 Bedroom, FREE car! From only $281! 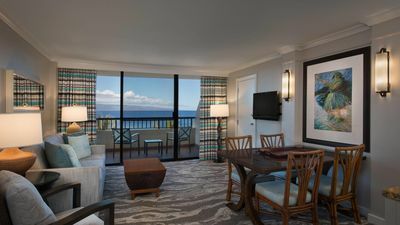 Maui Ka`anapali Villas Premier Studio A417 Last Minute Special - Contact Us!